I’m Henna, and I blog over at No Smoke Without Pryor. I was lucky to meet sweet Risa in college, and was more than happy to jump in with a guest post while she and Chris are on their honeymoon … hope you lovebirds are having a blast! Given a shared love that Risa and I have for food — specifically, REALLY GOOD food — I thought it might be nice to talk about the way we’ve transitioned our lifestyle as “foodies” as our family has grown. 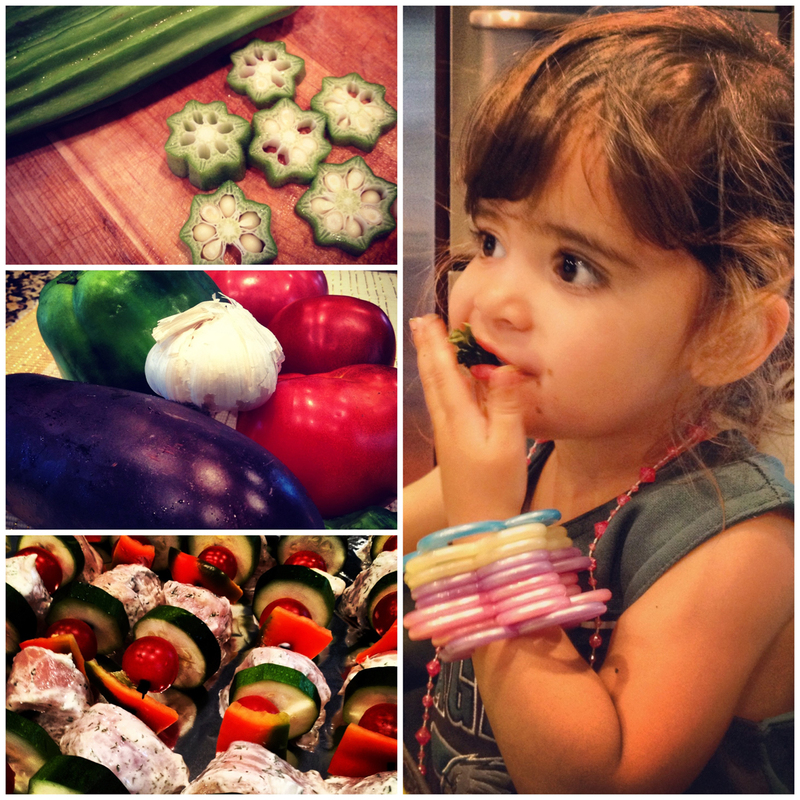 As a means of introduction, my husband Ian and I live in the Philadelphia/Delaware suburbs, and we have a 2 1/2-year-old daughter, Laila (above scarfing kale chips), and a 10-week-old boy, Zain. Before having children, you could find Ian and me in the newest “must try” restaurant and off adventuring with food at every opportunity. Food festivals, checking out new eateries, hunting for exotic produce and taking spontaneous trips to New York City to dine at the finest restaurants (side note: anything Thomas Keller is WORTH IT) was our normal routine. Now that we’ve got two little munchkins in tow, our dining out has become a little more about which restaurants have a decent kids menu (i.e. a menu sans Kraft Mac & Cheese) than whether the chef prepares his steaks sous-vide, so a little creativity has become vital to our food-loving sanity. We learned pretty quickly that if we wanted to keep good food in our lives on a more regular basis, we had to figure out how to bring it into our home. The farm that we support has a growing season of May through October, during which time we pay a flat summer rate (or monthly fee if you prefer) for an entire season’s produce. 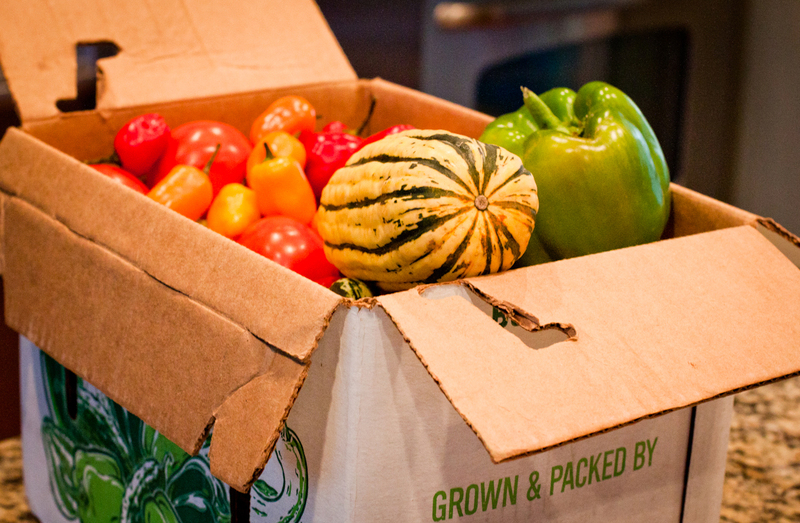 Each week, we receive a box of colorful, locally grown organic fruits and vegetables, which often changes week-to-week. A sample week looks something like this. We peek inside and try to guess what this week’s box might have in it — each week changes based on what part of the growing season we’re in, so it’s always a fun surprise to see what’s in store! We take inventory of what we receive and jot it down so we can meal plan for the week. 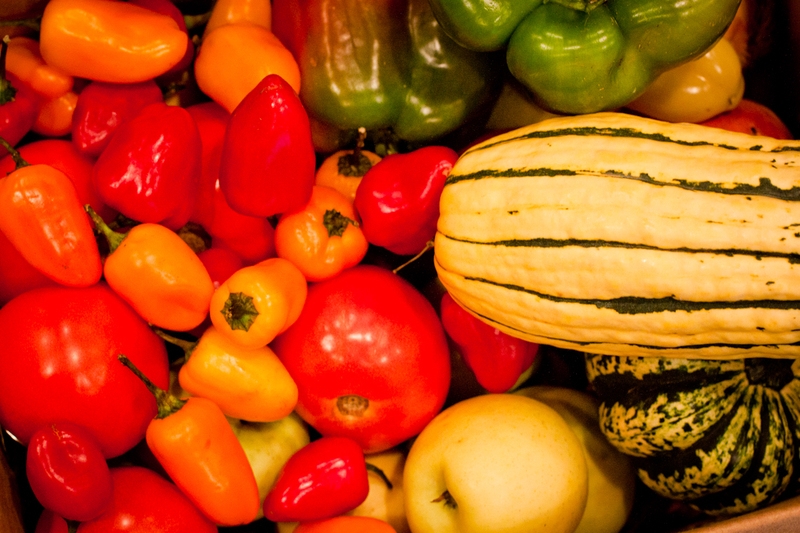 This week’s box included apples, bell peppers, smaller chili peppers, various squash/gourds, onions, yams, eggplant, tomatoes and corn. Because the box is often overflowing, and we’re only a family of four (one of whom is still exclusively nursing! 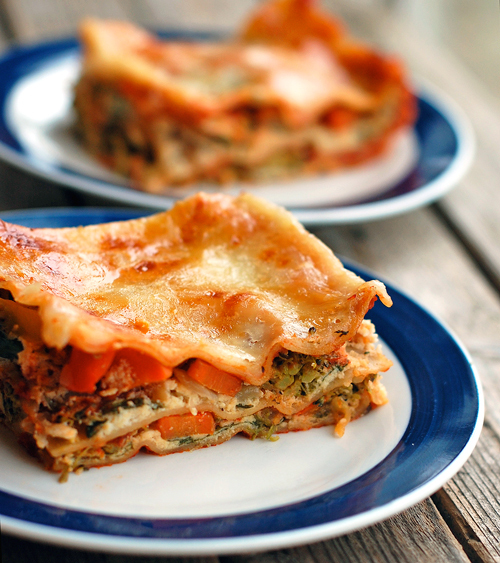 ), meal planning is an absolute must in order to not have food go to waste. We keep it simple — we keep a meal planning board and jot our ideas down at the beginning of each week so we know what’s getting used and when. Sometimes it’s more complex in the level of detail, sometimes it’s simple, but it works for us. My greatest source of recipe inspiration lately is Pinterest – hands down. If we get an abundance of green beans, for example, one search on Pinterest yields a ton of recipes that are popular, and almost always delicious. I’ve started to use Pinterest as my primary online recipe box! 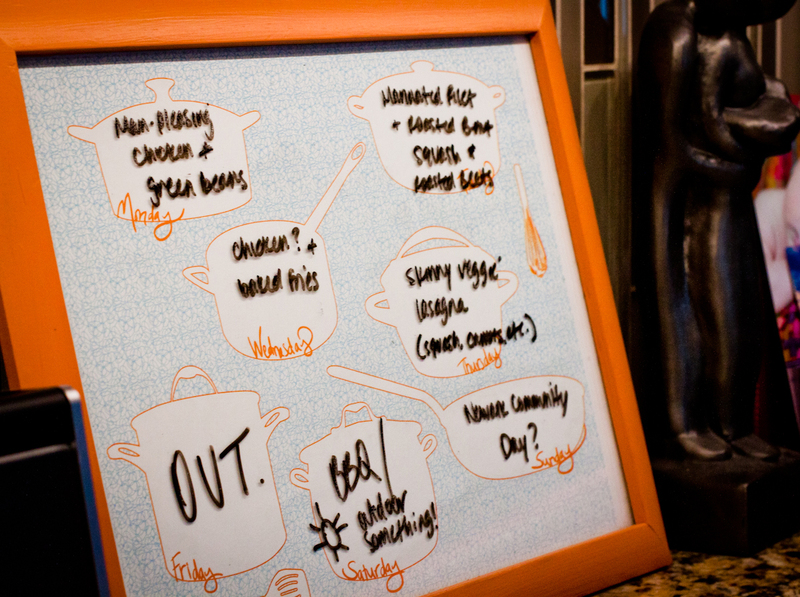 It’s a great way to file recipes you want to try, as well as past successes to refer back to later. 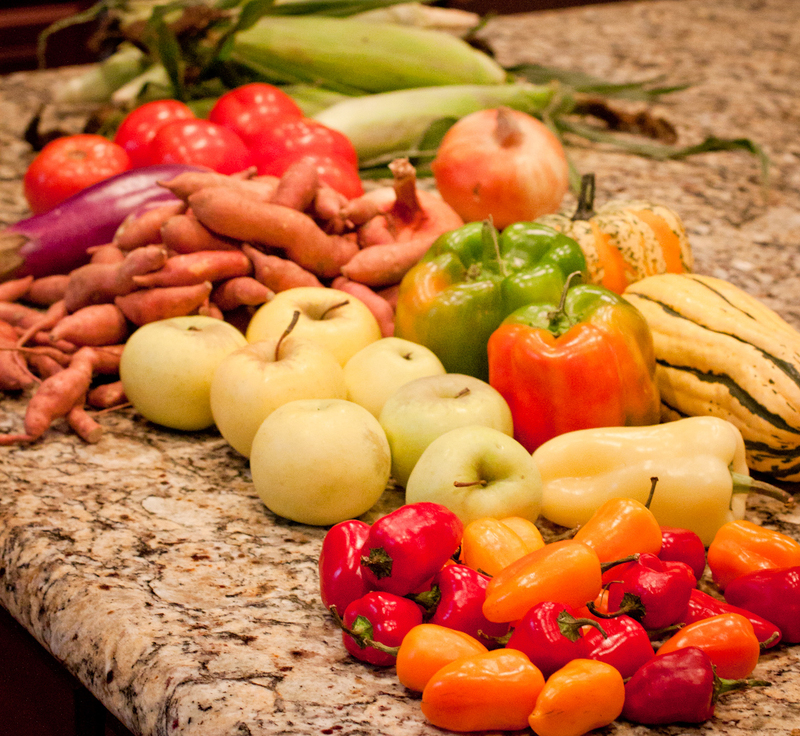 It’s actually not nearly as hard as you’d think to find recipes that can use up multiple vegetables at one time, and making them at home has allowed us to maximize the health AND flavor quotients! 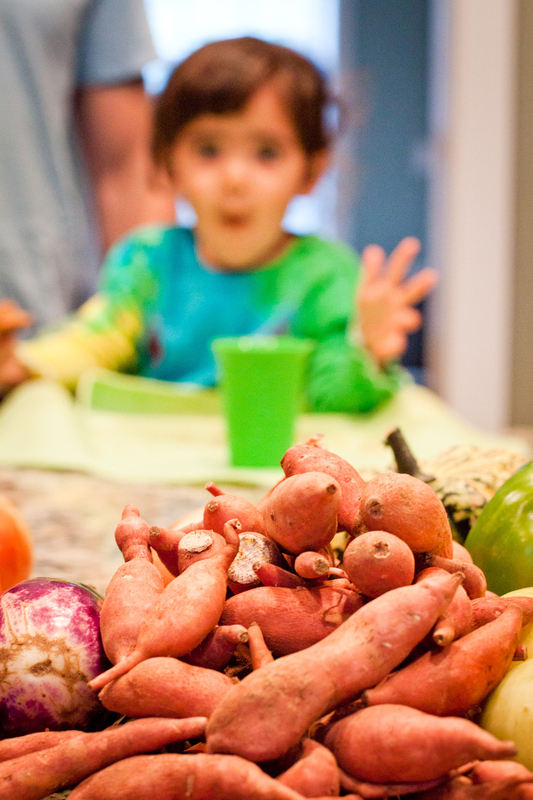 It’s really important to us as parents that our kids develop a taste for fresh, whole foods early, and doing the CSA has really allowed us to do that. 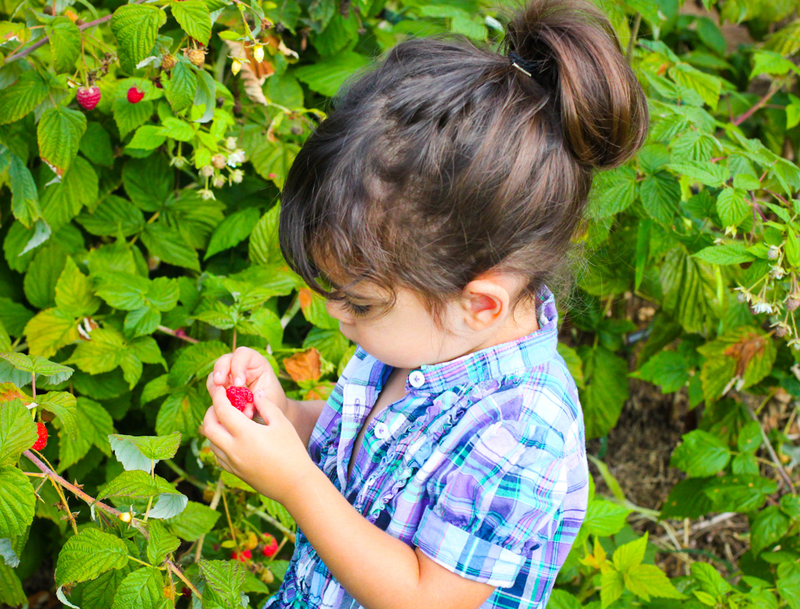 We have also taken a few trips to local farms and orchards to try to increase Laila’s understanding of where food comes from and how it’s grown. It’s amazing how much more likely a toddler is to eat something she’s picked herself! Thanks for having me, Risa! Happy eating!